A dramatic angle of heatbed and print plate. All has to come apart when I finally buy a timing belt, ofc. The printer, which I should really have named by now (I’m not very good at naming things), is almost finished, and I ordered the very last parts I think I’ll need from a local hobby robotics supplier today. It’s taken a lot longer than originally planned, mainly because I’ve been scared of doing the electronics. 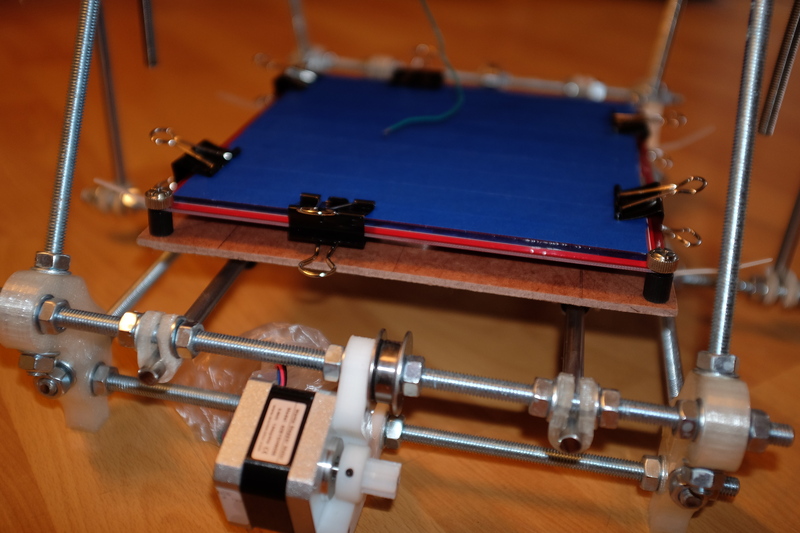 I wanted to build the printer myself, from scratch, and feel like I’d done as much as possible myself by the end of it. Partly through some sort of misplaced pride, partly because I wanted to learn some of the mechanical stuff, and mostly because I wanted to really understand the process so I can write about it in the future. But I have a mild phobia-like response to soldering. So the large bag of circuit boards, ICs, resistors, capacitors, LEDs and thermistors that I ordered as a kit from Open Hardware has been sat in a bag under my desk for months. Literally. I’ve put off getting started on putting them together because, quite frankly, I’ve been scared. 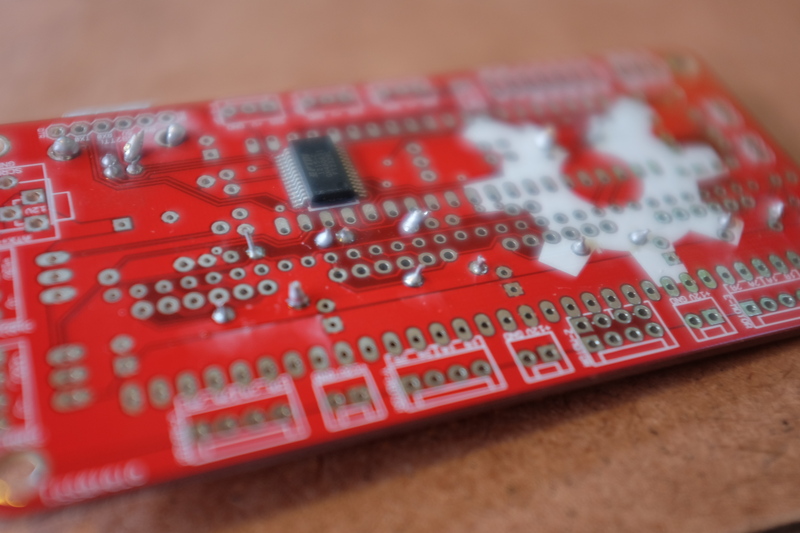 I’ve only weilded a soldering iron once – as far as I can remember – since I left school. I think I used to own one, but I can’t find it any where. The reason is pretty simple – when I was 15 and doing my GCSEs, I tried a few simple electronics projects in the CDT class (Creative Design and Technology, as it was then) and really screwed it up. I was cack-handed with a warm brand, to say the least. The project I chose for my primary coursework piece – a noble attempt to create a radio distress beacon for windsurfers – was an unmitigated failure largely because the piece of circuit board I built for the transmitter had an entirely silver rear, with cold, hard solder smeared all over the tracks of the bread board, ruining ever component thanks to the fact it was just one giant short circuit. The more I tried to fix it, with more solder, application of another iron and eventually a razer blade, hacking away at the tracks, the worse it got. Electrical engineering, I decided, probably wasn’t for me. And although I’ve built and taken apart countless numbers of PCs, laptops and other computers since then, I’ve always shied away from anything which required actual soldering. I’ve missed out – so far – on the Arduino revolution mainly because I fear a kit in my hands would turn into a soggy mess of plastic and metal, worse than an 80s popstar back on the road after a little too much time in surgery. With the RepRap electronics, I decided I’d like to try again. Even though my eyes can barely see the holes in the board, I am – depressingly – well off enough that I know if I mess it up I can always buy a pre-assembled kit, hide my shame and just cut down on Food Lover’s take away sushi for a month to pay for it. So I’m rather happy to report that while progress so far is slow, it’s also not looking too bad. I think I may have written the board off with my very first tap of the iron, and there’s some disturbing smoke trails which have stained the back of the board (which I think – hope – are more to do with the quality of solder than my misuse of the iron) But the actual quality of the soldering itself is, I think, not to bad for someone who is technically a novice. Who knows, perhaps I missed my calling? Perhaps not. Still, it will make me a bit more comfortable next time I visit the awesome guys at House4Hack .